Cambridge University Press, 9780521270144, 196pp. Can social order be maintained in a stateless society? Is anarchy viable? The contention of this book is that stateless social order is possible only if relations between people are those characteristic of community. Rejecting the libertarian argument that the goods and services which make up 'social order' can be provided by private firms competing in the marketplace, and the liberal argument that because social order is a public good its maintenance requires the state, Michael Taylor goes on to examine the methods actually used to maintain order in anarchic and quasi-anarchic societies and shows how these methods can be effective only in a small and stable community. Community in turn requires a rough economic equality. But according to a traditional argument (recently revitalised by Robert Nozick), no equality would survive for long without state interference - so that communitarian anarchy must break down. Here this argument is shown to be fallacious: the development of gross inequality can be prevented in an anarchic community. 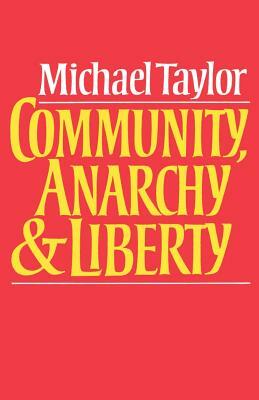 At the same time, the small community is not portrayed as continuously harmonious, free from constraint and coercion - the contention is rather that community is necessary if we are to live without the state or substantially reduce its role. But community is defended against the charge of being incompatible with individual liberty. That claim is shown to be no more accurate than the opposite and equally simple assumption, that liberty is possible only in community. For evidence and illustration, the book draws on the experience of stateless primitive societies, peasant communities and utopian and other 'intentional' communities. It sets a new standard of clarity and rigour for theoretical studies in anarchism and will interest a wide range of readers, including political theorists, political anthropologists and sociologists, and anyone concerned with the justification of the state.